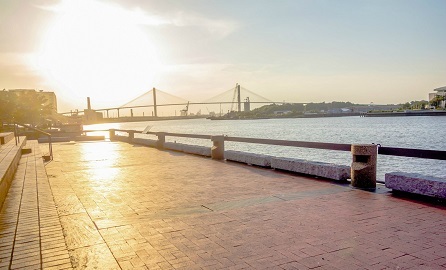 There is so much to do in Savannah, GA, and the beautiful parks that fill the city are an absolute must-see. When you spend your day going to museums and on historical tours, it’s good to have a place just to relax and enjoy the beauty of nature. Orleans Square in Savannah is the perfect place for that! Stroll along the blooming pathways, visit the beautiful German Memorial Fountain, enjoy a picnic in the grass, or simply sit back, unwind and soak in the sun. Discover all of the best things to do and see in our city when you access our complimentary Vacation Guide! Orleans Square in Savannah was the first square to be ever be established! It was created in 1815. Not only is it the oldest square in town, but it’s also the biggest one. It was named after General Andrew Jackson for winning the New Orleans battle that same year. He later went on to become a U.S. president. Located behind Savannah’s civic center and the Savannah College of Art & Design, Orleans Square is at the heart of the city’s history. In 1989, the German Memorial Fountain was installed at its center, celebrating the two major waves of German immigrants in the 18th and 19th centuries. You can also find the Harper-Fowlkes House that overlooks the square. This mansion was built in 1842 and is one of Savannah’s historic landmarks. Visitors love seeing this beautiful example of Greek revival architecture. Orleans Square is the perfect place to go for a relaxing walk. After you’ve taken a stroll, take a seat by the fountain on one of the stone benches. You can still feel the weight of time as you sit under the old oaks with the Spanish moss hanging over you. You can even pack a picnic lunch or pick something up to-go as you people watch from your perch. After spending the day strolling around Orleans Square in Savannah, come home to a comfortable room at Presidents’ Quarters Inn. 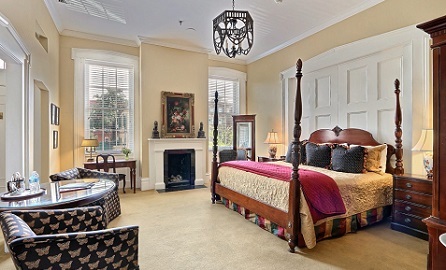 Our luxurious accommodations are the perfect setting for your Savannah weekend getaway and will provide you with a unique experience. 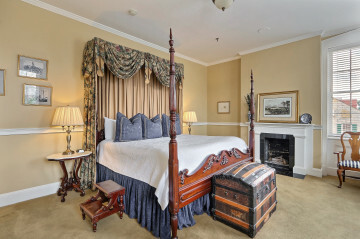 Book our Theodore Roosevelt Room and a spacious king bed and cozy fireplace. Take a hot bath in the private bathroom and nestle up by the fire with a glass of wine in hand. 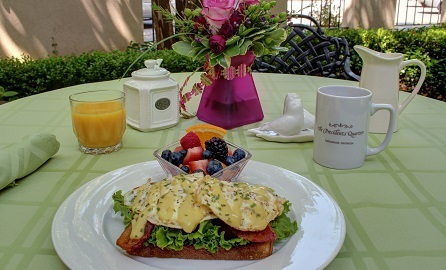 Wake up the next morning feeling as refreshed as ever with a traditional Southern breakfast. Book your stay today and get ready to spend the best weekend in Savannah, GA, at Presidents’ Quarters Inn!